Neither rain nor fire nor collapsing dams can knock out Bastrop State Park. Consider Bastrop State Park our own Rocky Balboa. Knock it down — it just keeps getting back up. The first punch came in the form of a wildfire in September 2011 that raged across 34,000 acres and affected 96 percent of the park. Firefighters heroically saved the park’s historic cabins using water and firebreaks, but thousands of trees burned, along with vast swaths of grasses and other vegetation. The next punch came in May 2015, when heavy rains washed out a dam and drained a 10-acre lake. The third blow: the Hidden Pines Fire, which ignited Oct. 13, 2015, and burned 4,500 total acres, including some within park boundaries. The latest punch came this year when Bastrop experienced a damaging flood on the one-year anniversary of the 2015 Memorial Day flood, forcing the closure of park roads and campgrounds. Yet the park, while perhaps a bit battered and bruised, still bustles with activity. Visitors book cabins and campsites, picnic in day-use areas, hike many of the trails and cycle happily down hilly Park Road 1C between Bastrop State Park and its neighbor, Buescher State Park. In fact, as recovery efforts continue, park staff point to positives that rose from the ashes. One obvious positive result of the crises: An army of volunteers helped replant 1.5 million pine seedlings. More people feel connected to the park than ever before. The fires also provided a hands-on learning opportunity for emergency responders and restoration experts, Creacy points out, helping them better prepare for future disasters. It also created research opportunities. The Texas Parks and Wildlife Department has partnered with Texas A&M University, the University of Texas, Texas State University, St. Edward’s University and the University of Missouri on projects examining how wildfire affected animal and plant communities, soil moisture and the water cycle. Immediately after the 2011 fire, scientists mapped its intensity to help figure out how to best facilitate recovery. In the most intensely burned areas, no pines survived to provide seed for natural regrowth, so replanting was focused on those spots. Monitoring revealed that seedlings planted in areas with standing dead trees did better than those placed in cleared areas. They also found that areas in the park where prescribed burns took place before the fire fared better and recovered more quickly. 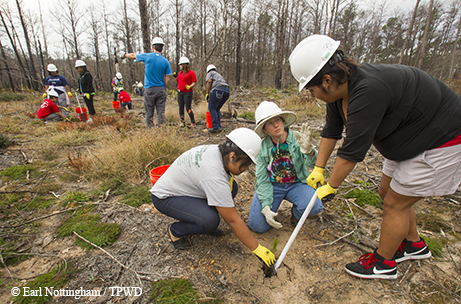 Volunteers have helped plant 1.5 million pine seedlings in areas affected by the fires. Another TPWD-funded study examined tree rings to determine historic fire patterns in this area. Tree rings in Bastrop revealed that, before settlers came, lightning strikes or Native Americans ignited fires every six or seven years. Recovery efforts focus on helping along what would happen naturally. For the most part, standing dead trees and downed trees have not been cleared in the park. Dead vegetation provides nutrients to replenish the soil and habitat for young plants and wildlife. Clearing would also require heavy equipment, which could damage the soil. Wildlife returned to the park immediately after the 2011 fire. 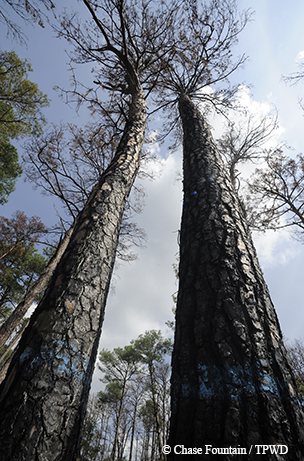 Bastrop’s “Lost Pines” are part of a 70-square-mile stand of loblolly pine and hardwoods separated from East Texas pines by approximately 100 miles. After persisting here for more than 18,000 years thanks to sandy soils and a layer of clay that holds water, the Lost Pines became genetically unique. For the past couple of years, park staff members have been harvesting seeds from the remaining trees in Bastrop State Park and have been using this seed source for their tree planting operations. 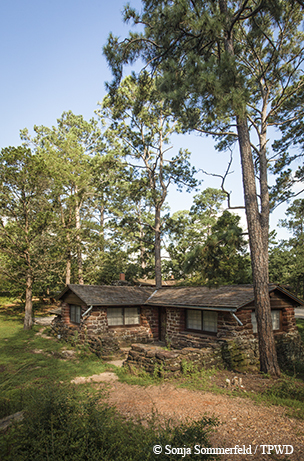 Twelve of 13 Civilian Conservation Corps-built cabins remain available for rent at the park, and surviving trees still shade the area around them. The park also offers 35 full-hookup sites, 19 campsites with water and electricity, 16 with water only and seven walk-in sites with water nearby. Primitive campsites remain closed pending restoration and improvements on backcountry trails. Plans also are underway for a replacement dam to restore the lake, a process that will take a few years. In the meantime, saplings push up from the rubble, wildflowers brighten open areas, and birds sing in the remaining 80-year-old pines on the hillsides. You can’t keep a good park down.